Solar power systems, or photovoltaic systems, are widely considered to be one of the cleanest and efficient ways of producing electricity for buildings. Moreover, since these systems can be installed on building rooftops, they have the potential to produce all of the net electricity that a residential or commercial building needs. Solar technology has evolved rapidly over the past few years; as a result, costs have come down so dramatically that, in many cases, the cost for rooftop solar electricity is less than grid electricity. However, there may be a dark cloud on the solar horizon. To minimize installation costs, many solar designers connect the panels together in high voltage “strings” – typically operating at 250 to 400 direct current volts, up to a maximum of 600 volts DC (1,000 volts DC in Europe). If there is a short in one of these wires – perhaps caused by improper installation, animal damage or just wear over time — the wires will arc as long as the panels are in direct sunlight. This electrical arc produces extremely high temperatures, high enough to melt through metal enclosures – and certainly hot enough to cause a fire. These high voltage systems can present a danger to solar installers and electricians who are not taking the proper precautions during installation and servicing, and can be quite dangerous to firefighters who may be called to the scene in the case of a fire. A great deal of effort has been directed towards ensuring the continued safety of the approximately 100,000 solar power systems in the U.S. But several property loss incidents have occurred, a few of which are summarized below. Equipment has been designed to minimize the chances of high voltage DC arc faults. Unfortunately, wear over time, animal damage, improper installation or other problems can still result in a high voltage DC arc fault even in the best designed system. Regular system checkups are being recommended for existing systems. These measures increase the likelihood that problems can be identified and resolved before they result in a fire. Additional safety devices are being installed. New codes are including multiple DC disconnect devices to protect the solar array, the conduit containing this high voltage wire, and the inverter itself. Automatic DC disconnect devices are also being considered. However, anytime there is high voltage DC in a system, arcing hazards exist. Solar panels are now available with micro-inverters so that they operate with safer AC current – the same as used in conventional household wiring. These panels completely eliminate any high DC voltage that can create an arcing hazard. Long ago the electric power industry transitioned from DC power to AC power; for safety and performance reasons it is very likely that the solar industry will make a similar transition. Arc-sensing high voltage DC inverters are on the drawing boards at several existing inverter companies. If and when these inverters become available they should be able to detect DC arc faults and automatically shut down before a fire occurs. Solar Fire Raises Questions About Panel Safety. Building Codes Leave Firefighters Unable To Fully Kill Power. It looks like this 2010 fire was caused by a short in the DC disconnect section of the inverter. 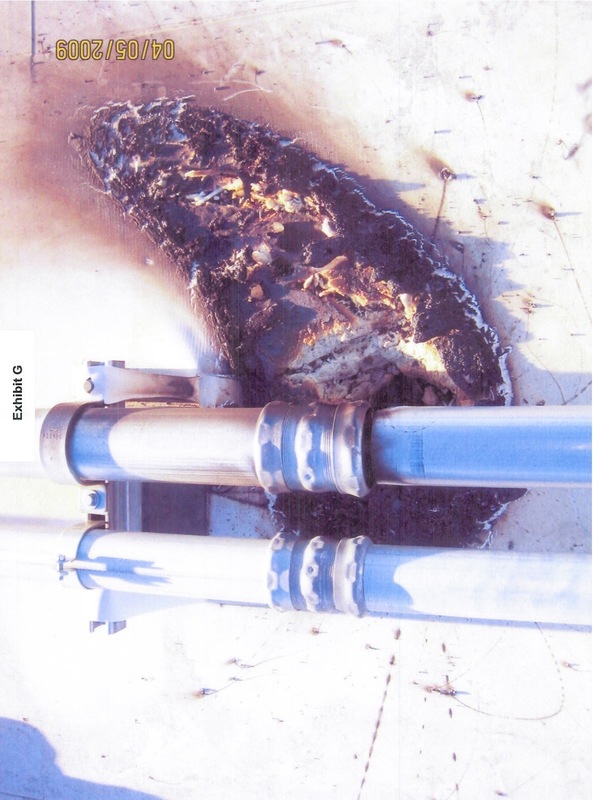 Industry experts think that this 2009 fire was caused by improperly installed DC conduit. 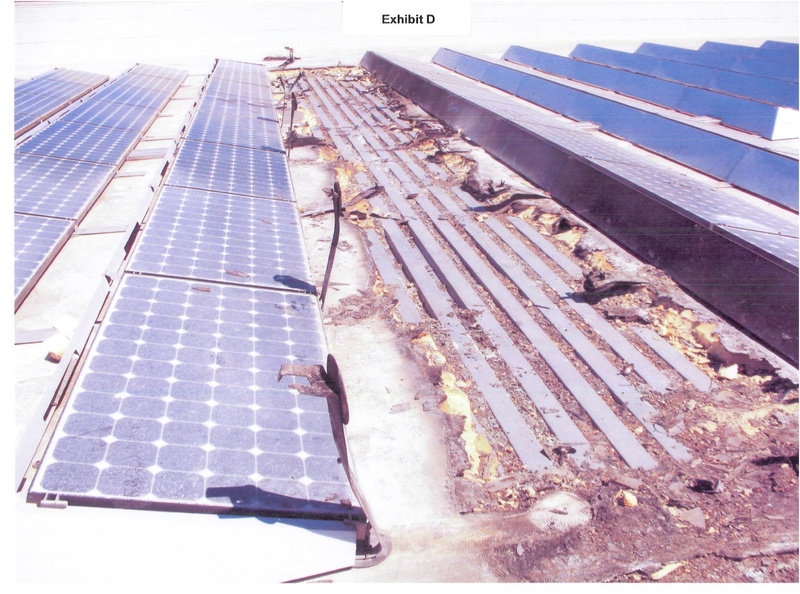 Thermal expansion and contraction of the conduit resulted in two sections becoming disconnected, which shorted out several high voltage DC circuits, burning several rows of solar panels and damaging the building’s roof. 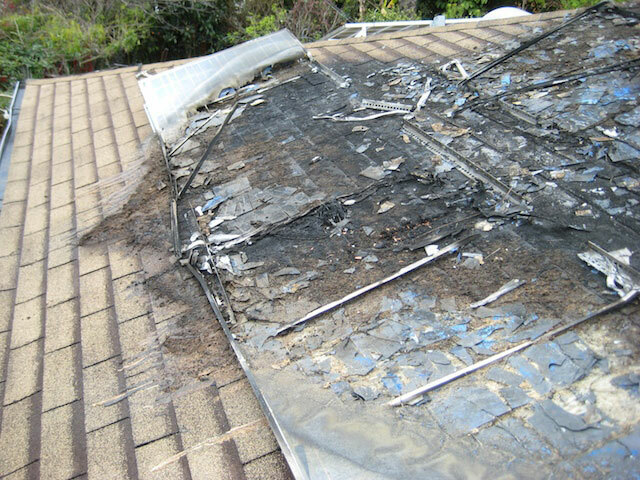 Fire department investigators determined that this 2009 fire was caused by the solar panels, most likely a high voltage DC arc fault. Looks like the combination of a DC arc with debris under these panels provided enough fuel for a fire that burned both the roof and the panels. One possible cause of this 2009 fire in Germany is a junction box short or wiring fault caused a high voltage DC arc that ignited the wooden roof of the building. This entry was posted on May 4, 2010 at 3:38 am and is filed under Solar Safety with tags fires, panel, panels, rooftop, safety, solar, solar-fires, solar-panel-fire. You can follow any responses to this entry through the RSS 2.0 feed. You can leave a response, or trackback from your own site. Good start to your blog, looking forward to more articles relating to safety of solar power installations. Have also shared this blog with my Twitter followers.